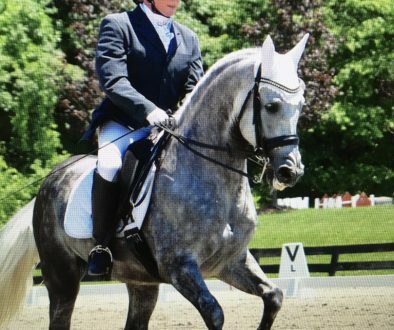 What or who inspired you to ride Dressage? My mom inspired me since she asked me to go on a horse shopping trip to Spain with her. She was looking for a dressage horse, and I was currently riding hunter/jumpers. I was able to ride some of the wonderful Spanish stallions and I was immediately hooked! This was four years ago and I bought my first (and current) dressage horse a year after that trip. What is your occupation that allows you to ride? What have been your successes in the show ring? I was the 2018 region 7 3rd level adult amateur champion. I also just received my silver medal after obtaining my final scores at a recent show here in LA. What have been you aha moments in training? My aha moments happen everyday it seems! I would say my very first one happened when I really felt the correct flexion and bend in the rib cage and how my horse took a very nice and steady contact with the outside rein. 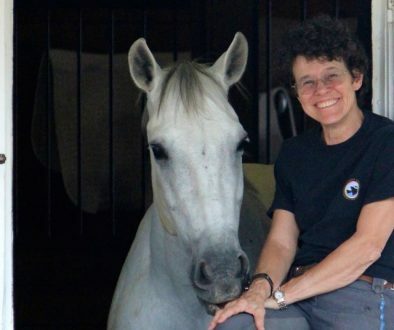 More recently, I rode in a clinic with Lilo Fore and she helped me deal with my horse’s spookiness by riding him more forward. 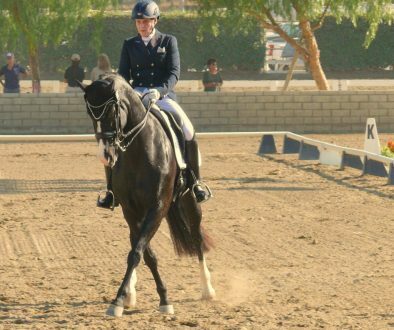 What is the most difficult thing and riding dressage? The most difficult thing about dressage is the highs and lows. A rider must truly be patient with the process and expect there to be times when nothing seems to be going right. You just have to keep working at it, and eventually, things will fall into place. The other thing that I constantly have to remind myself is how physically demanding this sport can be. It may look like the top riders just sit there and look pretty, but that is far from the case. The core stength and overall fitness required should not be overlooked. Riding a true extended trot takes some serious core muscles! Which trainer(s) have you worked who have made the most differences to you and your horse(s)? I currently ride with Lars Holmberg and Ulf Wadeborn. I have ridden with them from the start of my dressage career and can say that I whole heartedly believe in their training system. They are from Sweden and really focus on the training scale and not skipping steps. You must be patient and the results will come. A focus on suppleness, alignment and gymnasticizing the horse are their main goals, along with overall horse happiness and soundness. I feel lucky to have found these two trainers from the beginning. Do you own other pets? I grew up with Akitas and I hope to get another one eventually when I move somewhere with more space in the future! What advice can you give other amateurs based on your experiences? My advice to other amateurs is to not limit yourself by thinking that you are “just an amateur.” Speak to as many professionals as you can, go to clinics and educate yourself outside of your regular lessons. Try to become an independent rider and not rely on a coach for everything. Step outside your comfort zone and you will see the growth that can happen! 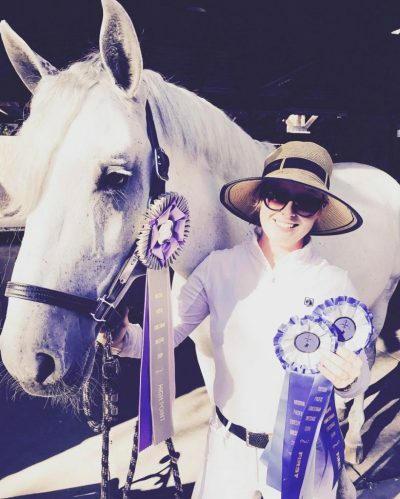 Are you a Dressage Amateur and want to be a featured rider? Consult with your doctor before beginning any riding program. The creators, producers, participants & distributors of this program shall not be held liable in any way whatsoever for any and/or advice given in this program. Viewers and members engage in these equine sport and activities at their own risk. 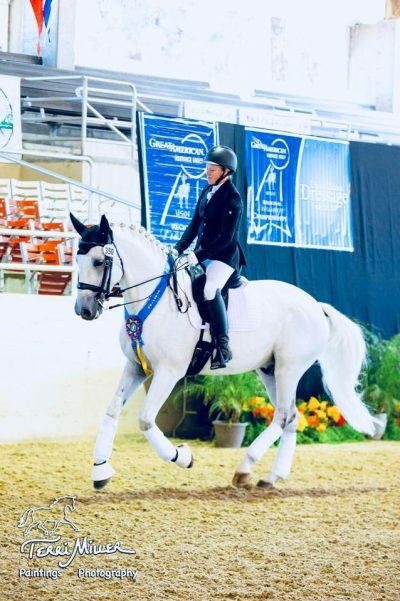 AADA is a privately funded support organization developed for Adult Amateur Dressage Riders. It is not associated with USDF, USEF, FEI or any other equine membership association in the United States or abroad.